Ok, so we’ve got the shoe covered for the guy who loves a classic silhouette, the B01. What about the one who loves a sportier-looking sneaker that’s meant for casual days, such as this cool high-top silhouette that’s decked with a Tribal motif on a comfy knitted body? 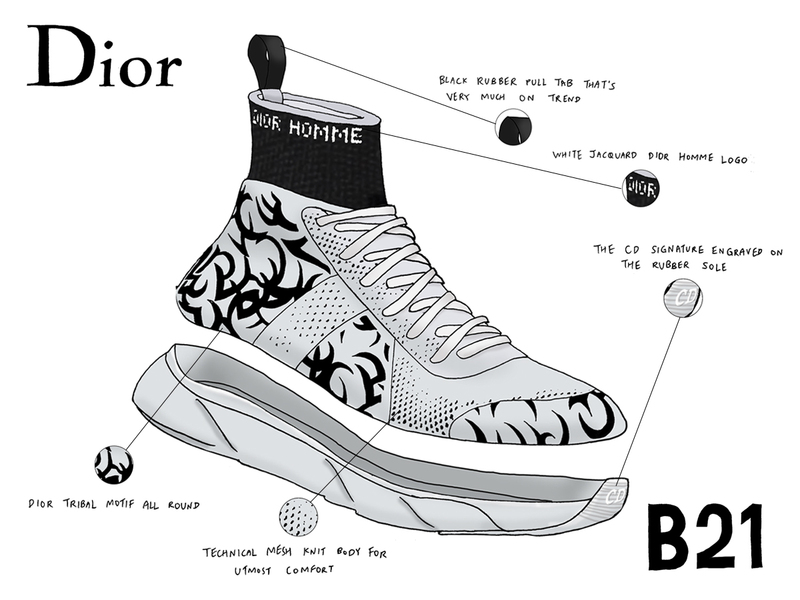 Coined the B21 Socks, you can call this pair Dior’s very own version of the high-top trainer that’s gaining traction amongst sneaker heads worldwide. Starting from the top, you will find a black rubber pull tab that doubles up as a shoe horn – pulling it back will aid in you slipping your feet easily into the sock-like upper. While giving you an all-round comfy grip around the feet, the technical mesh knit also scores high points on design and is decorated with the Tribal motif – a key print in the Fall-Winter 2018 collection for men. Together, the mesh upper is welded with a lightweight and ultra-soft rubber sole (another Dior signature) in a modern version that’s simply known as the B21 Socks (SGD1200), which is now available at Dior’s ION Orchard boutique. Before we go, here’s a note of advice on caring for the sneaker. Always remove dust with a soft brush, before cleaning with a slightly damp sponge and mild soap while avoiding the parts in leather. This in turn will ensure longevity your sneakers, one that will continue to be in your lineup for seasons to come.